19" Personalized Snowman Stocking - has a happy snowman with a scarf and a snowflake and holly leaf appliques. Absolute attention was given to quality and design in this Christmas stocking. 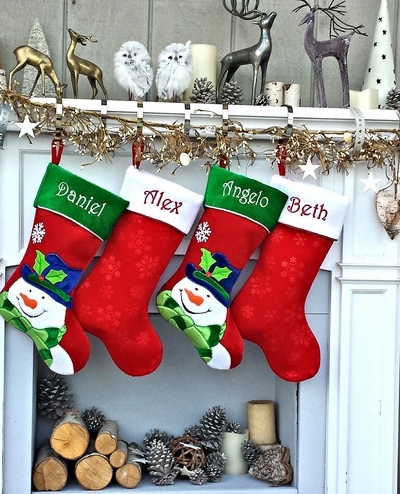 We just add a name in embroidery to make this stocking a such a Christmas joy for anyone who is lucky to own it. We have other Christmas Character Designs in these velvet applique stocking series so you can create a set. See Additional Images for Inspiration. Names can be monogrammed onto the cuff of this Christmas stocking with Gold, White, Ted, Blue or Silver metallic embroidery thread to compliment the body of the stocking and the fabric design. Please provide the names to be monogrammed on the stockings in the Personalizing box; separate each name with a comma. Select the color of the metallic thread and font style in the Personalizing Method drop down menu.